The effect upon the author's personality was radical; he was turned in upon himself, revised his whole Weltanschauung, and became a writer instead of a painter. "Wakefield brought me the death of one thing, the birth of another. Compared with this aspect all others fade into complete insignificance. I cannot call this bad or good, for it has become a part of myself. (1932: 497). His achievement in removing from the minds of his countrymen certain misconceptions regarding our egoism and self-righteousness was similar to the achievements of André Maurois in convincing the French that we are not really so barbaric and unreliable as they had been keen to suppose. (Anon. 1932b: 9). surpassed by very few, if any, accounts of personal experience in the war; but it is also something more, a profound statement of the adventures of the spirit in a solitude from which all purposive action, except the meanest, was forcibly excluded (Anon. 1932a: 22). This was the first war… where internment of enemy aliens was practiced as a form of warfare and reprisal. After reading his volume, powerful in its reticence and understanding, one can only pray that it will be the last. (1932: 2). The death of Paul Cohen-Portheim is not merely a sad deprivation for his friends: it is a serious blow to the cause of intellectual understanding between the Anglo-Saxon and the Teutonic peoples. (1932b: 9). Anon. (1931) ‘The Bookman’s Tale: Time Stood Still’. In The Bookman 80 (479). Anon. (1932a) ‘Death of a famous Author’. In The Observer ,16 October 1932, 22, col. e.
Anon. 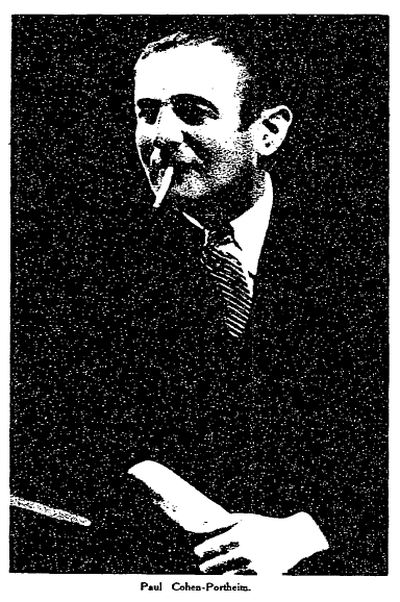 (1932b) ‘Obituary: Herr Cohen-Portheim’. In The Times, 18 October 1932, 9, col. C.
Anon. (1932c) ‘Obituary: Herr Cohen-Portheim. An Observer of England and Europe’. In The Times, 8 October 1932, 14, col. B.
Cohen-Portheim, P. (1932) The Discovery of Europe. New York: E P Dutton & Company. Cohen-Portheim, P. (1936) Time stood still: my internment in England 1914-1918. London: Duckworth. Feld, R.C. (1932) Book Review: Men for Whom ‘Time Stood Still’: A Remarkable addition to personal literature of the war in a record of Civilian Internment as an Enemy Alien. Time Stood Still. By Paul Cohen-Portheim, New York: E. P. Dutton & Co. In The New York Times Book Review, March 20 1932, 2. Ketchum, J. D. (1932) ‘Cohen –Portheim, Paul.. Time Stood Still: My Internment in England, 1914-1918 (Book Review)’. In American Journal of Sociology 38:3, 496-497. Phelps, W. L. (1935) ‘Cause of Nationalism’. In The Washington Post, September 3 1935, 9. Willoughby, D. (1931) ‘War and Post-War’. In Saturday Review 152 (3958), 304-305.